In the previous post, I showed the way to simulate Geithner plan by Excel for three probability density functions(uniform, normal, log-normal). 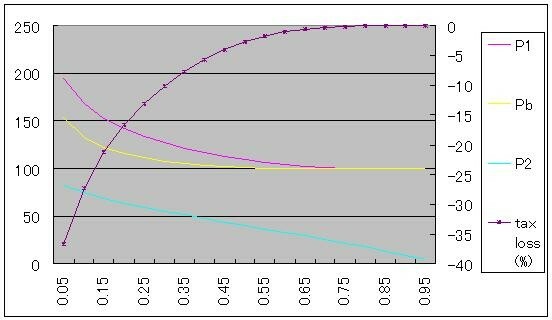 In this post, I show some graphs from the simulation. Here I use log-normal PDF, for it is the most probable function of the three. Specifically, I assumed that ln(P) follows N[m,s] distribution, and set mean m as ln(100)-s2/2. That means expected value of P (=E[P]) is always set as 100. First, change standard deviation s from 0.1 to 1.1 by 0.05. Self financing ratio k is set as 1/7 as in the Geithner plan. X-axis is the simulation factor s, as described above. P1 is the expected price conditional that non-recourse loan not be used. P2 is the expected price conditional that non-recourse loan be used. Pb is the break-even bid price. p1(right-hand scale) is the probabaility that non-recourse loan not be used. 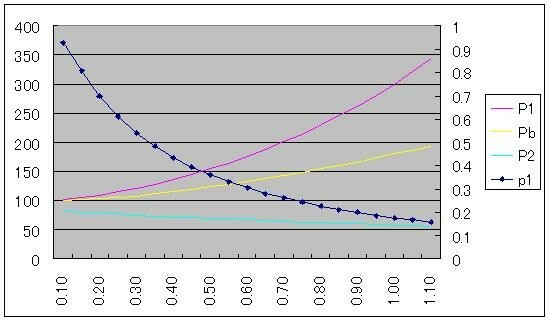 As s increases, P1 and Pb goes up, and P2 decreases gradually. 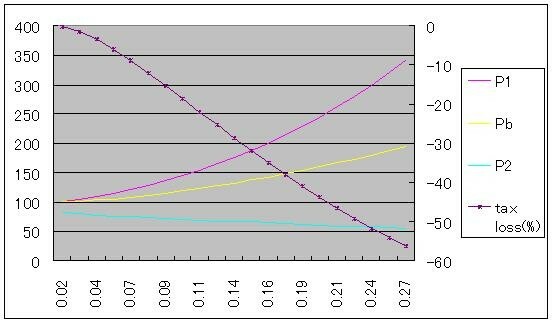 p1 decrease from over 0.9 to near 0.1 for the simulated range of s.
The graph below shows taxpayer's loss (FDIC's loss, to be exact) as percentage of (1-k)Pb(=the value of FIDC non-recourse loan), instead of p1 for the same simulation (right-hand scale). 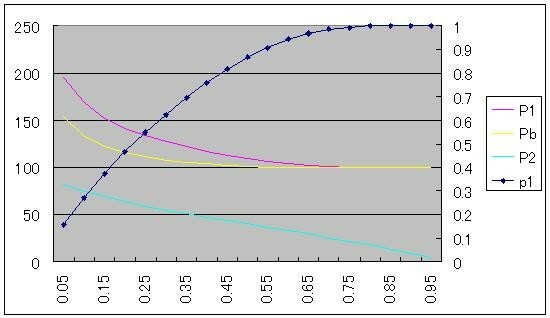 X-axis is same as above, but numbers are changed from s to s/m (coefficient of variance) so that the meaning of x-axis becomes more easy to grasp. For coefficient of variance of 0.27, FDIC's loss ratio reaches near 60%. Next, change self financing ratio k(=1 - non-recourse loan ratio) from 0.05 to 0.95 by 0.05 (this includes Treasury funding). s(standard deviation) is set as 0.5. When k increases from 0.15 to 0.45, Pb premium to E[P] decreases from 22.0% to 2.3%. Maybe low k value(1/7=14.3%) in the Geithner plan was set in order to provide enough (over 20%) subsidy to the bank. FDIC's loss ratio is as follows. If non-recourse loan ratio (1-k) is about 75% instead of 85.7% in the Geithner plan, the loss drops in half (around 20% to 10%). If (1-k) is 50%, loss becomes less than 3%.